This is our second year in which we have our small groups meet before our main service for students on Wednesday nights, on campus, from 6-7pm and then we have our service for students at 7:30pm. It’s been going so, so well (when I told Josh Griffin we are making this move, he told me it would not work and we have 65% of our students in groups BTW, I won’t let him live it down). 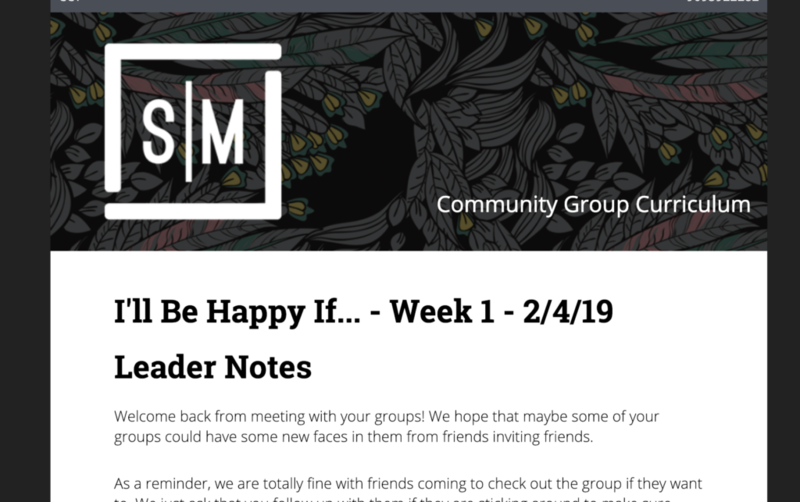 But something we added this year and I LOVE IT, and sad I didn’t think of it before, we started using the DYM newsletter app to house our small group curriculum. I KNOW! SMART! (If you already do this, you are way smarter than I). We use the newsletter for so many things in our ministry already (leader updates, parent emails, etc) and now we add our curriculum in that format as well! It looks so good, really easy to use and edit and leaders can access it via their smartphones. Well, do you just make a new one every week? I’m sure you could, but we just copy and paste the previous week’s into a google doc to save it and then we just edit the existing one so the newsletter link never has to change. Leaders can just have the link bookmarked on their devices so it’s automatically updated every week. Our team will update the new curriculum every Monday for those leaders who want to look it over beforehand (I love those leaders). We have enjoyed this format and it seems to be working for us and just wanted to share with you! Do you do something similar? What curriculum do you use? Do you write your own? Buy some? Share below! PS: If you have not subscribed to my podcast on the DYM Podcast Network, we would love for you to join on the journey of YOUTH MINISTRY HACKS PODCAST!